After the Ferrybridge fire and Hunstanton nuclear power station, more bad news for the hard pressed National Grid. 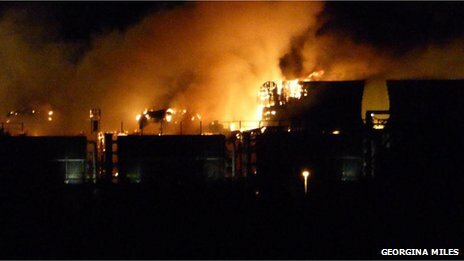 Fellow Didcot resident Leila Qureshi said: “We got quite near before the road was shut. Ah good Rog you got the story. 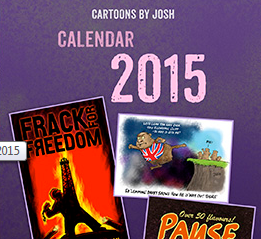 Didcot is my local power station. This is a critical station. It also includes 550MW for JET at Culham. Recently the older cooling towers from the coal fired station (Didcot is a railway town) were blown up demolished. Logically this ought to have been replaced by a nuclear reactor, the area is in nuclear valley and few miles from Harwell and Rutherford (home base of NRPB) and so on. So what has caught fire? How can this happen? If it is the steam plant cooling they should be able to operate the gas turbines without. There is media coverage today of cracks found in two of the 6,000 graphite bricks in one of two Hunterston B reactors. For a description of the different types of axial cracking please click on the diagram to the right. so reliable this nuclear stuff!! Once is happenstance. Twice is co-incidence…? Sizewell is having planned maintenance work done, according to the website you linked to. So it’s not ‘half-dead’ as someone claimed above. Surely this means Mr. Gummer will have to authorize more windmills to be built. The Inuit have a term ‘three dog night’, referring to how many Huskies are required to combat the extreme cold. As a rough approximation, I reckon ‘three Huskies’ is approximately equivalent to two 15 tog duvets! So my recommendation for this and future UK winters is to adopt a large dog (or two or three), stock up on candles and invest in at least one wood-burning stove. Perhaps one day we might have people in charge of energy policy who have not escaped from the lunatic asylum, but I doubt it will be anytime soon. ‘Ed Miliband and Baroness Worthington, the most expensive man and woman in Britain’s history. National Grid is now just “one unexpected event” away from being forced to restrict energy use after a fire at Didcot power station near Oxford put a unit supplying half a million households out of action, according to Peter Atherton, an analyst at Liberum Capital. The threat of electricity shortages in the coming months was already heightened after a spate of accidents at UK power stations in recent weeks. Together, they have left five plants out of action, accounting for about 5 per cent of total generation capacity. As a result, the amount of spare generating capacity the country has during peak demand has dwindled to just a few per cent. “We’ve lost two-thirds of the fat going into winter. We still have enough capacity to meet demand – provided that nothing else goes down and that we don’t have a cold winter. So much depends on the weather,” said Mr Atherton. “Normally I would put the odds of a security of supply incident at about one in 20. A week ago I would have said one in four and now, following the Didcot fire, I’d say one in three,” he added. Angelos Anastasiou, an analyst at the City firm Whitman Howard, agreed the UK power system was looking stretched. “Are we creaking? Yes is the answer. Last year may have lulled people into a false sense of security because it was very mild – about 2C above the norm, which makes a big difference to electricity use. And if we get colder than average weather this year that could be quite significant,” Mr Anastasiou said. Ford: so reliable this nuclear stuff!! Most of the nuclear fleet is at or near the end of its planned life. Engineers know their stuff. Then Govt idiots come along and say, “Well, never mind, we can extend it another 7 years” – as if they know their arses from their elbows. 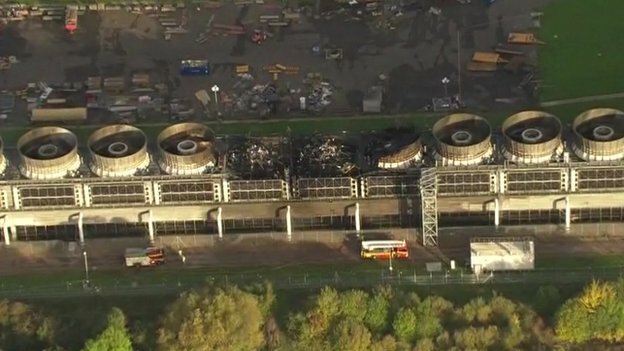 Coming mercifully on a warm weekend, when electricity demand was low, the devastating fire at Didcot B is a reminder of the fragility of Britain’s power supplies, after successive governments neglected our needs in pursuit of green policies. Let there be no doubt about who bears much of the blame for our vulnerability. As Energy Secretary in 2008, it was Ed Miliband who drew up the Climate Change Act, committing Britain to unachievable and ruinously expensive targets for cutting carbon emissions. Are you sure the reason is not to have to pay the billions of decommissioning costs? there are according to you 3 large units (the ones with cracks) that require deconstruction, cooling and storage. What is the going rate for decommissioning. Ford: I’ve seen the DECC budgets, they have been setting aside vast sums for decommissioning for years. If that was the reason, they’d have been building replacements on the same sites to avoid a whole site cleanup. No it’s just inertia, stupidity and a gross dereliction of duty.